Natural oral spray that has an antiseptic effect, which is recommended for infections of the oral cavity, gums, and the pharynx. 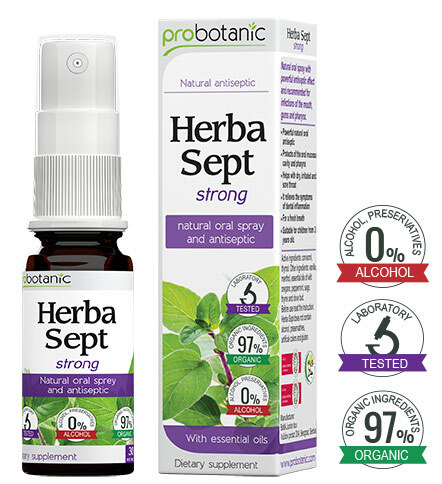 Herba Sept strong does not contain alcohol, artificial colourants, sweeteners or gluten. Contents of active ingredients: organic ethereal oil of wild oregano (Origanum munitoflorum), ethereal oil of mint (Mentha piperita), ethereal oil of sage (Salvia officinalis), ethereal oil of thyme (Thymus vulgaris), and ethereal oil of clover (Syzygidum aromaticum). Other ingredients: organic water of wild oregano, Origanum minutiflorum, menthol aroma. Prior to each application, it must be thoroughly shaken. The product is not recommended to pregnant women, nursing mothers or to children below three years of age or to the persons hypersensitive to any of the ingredients of the product. The recommended daily dosage may not be exceeded. The preparation is not a replacement for versatile and balanced diet. Keep out of reach of children. Herba Sept strong may be turbid due to its natural ingredients. Approved by the Ministry of Health of the Republic of Serbia – the Decision No. 10327/2017 dated 13/03/2017.